Conflict Unknown: Drawings, Prints and Paintings by Lale Westvind is the latest exhibition at Open Space’s new location at 512 W. Franklin street. The exhibition reflects Westvind’s prolific artistic output by containing an immense amount of work in a variety of mediums. 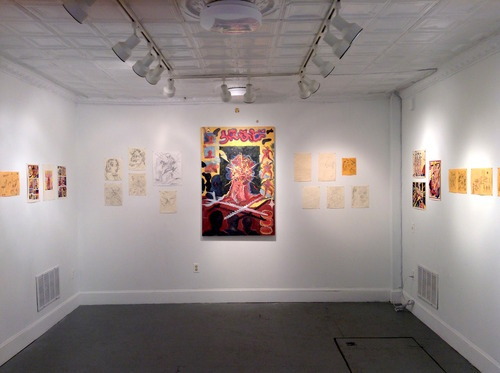 The works on display are taken from, or inspired by, Trial One, Westvind’s third and final book in her comic series Now & Here. A majority of the work in Conflict Unknown are graphite drawings done on approximately 11″x17” paper hung in single rows on the two opposite walls entering the space with larger paintings and screenprints hung on the the far wall. In addition to the works on the wall, there are copies of Trial One and Westvind’s previous comic books on for viewers to look through. This is the second exhibition of Conflict Unknown which was shown in a different format at the Booklyn Art Gallery last November. Open Space’s poster for the exhibition is conceived in a similar typeface as the original posters for Ridley Scott’s 1982 classic movie Blade Runner. The two share similarities both formally and theoretically in their view of an dystopian, authoritarian environment, but personally, I can’t help but think of this superficial relationship due to the coincidence that Blade Runner happened to be showing the same week in the revival series at the Charles Theater. Both have imagery based around futuristic realms where cold steel machinery and human flesh are simply interchangeable materials that collide into each other in countless ways. The strength of Westvind’s work is how she takes these recognizable and almost clichéd science fiction motifs and perverts them to elicit an original guttural reaction from the viewer. Throughout the exhibition, there are references to different forms of futuristic transportation. The combination of intergalactic travel and the automobile is a familiar one that has been around since the inception of science fiction. However, Westvind reimagines this old trope by rendering the cars and planes in the paintings “Hax 1 & 2” with surfaces that exist metallic and fluid simultaneously. These vehicles appear more like living organisms than the actual human characters in Trial One which sometimes look cold and synthetic. In “Shields”, Westvind mounted three vintage hubcaps to the wall of the gallery, as if to create a realm where automobiles concurrently present themselves as antiquated artefacts and futuristic vessels. Throughout the different mediums, Westvind’s characters are presented in constant motion, being blurred and abstracted. Her aggressive use of graphite portrays them to be uncontrollably hurdling through space, barely being contained in the two dimensional format. They are almost inseparable from the motion of the environment they occupy and become one with the exploding machinery around them. Halfway through the opening of Conflict Unknown, Westvind did a reading from the series of Here and Now. As her voice echoed through a guitar amp a seethingly loud ambulance siren could be heard passing by on Franklin Street. This coincidental noise added to the cacophony of Westvind stream of consciousness writing. The siren accompanied the poetic urgency that was felt through the reading and created a synesthetic effect with the visual work on display, instilling an overall feeling of abjection. 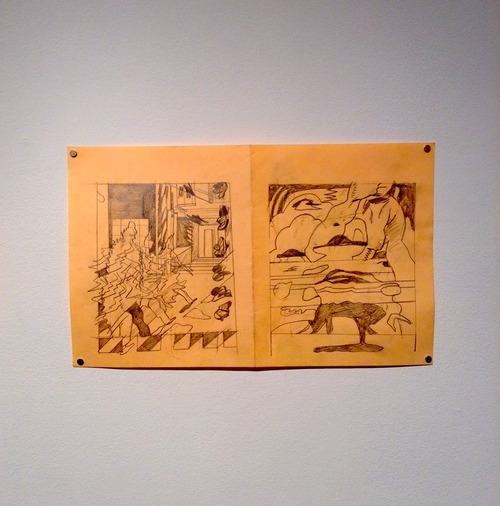 While Westvind’s Paintings and Prints in Conflict Unknown seemed to challenge the layout structure of the comic in an intriguing manner, the graphite drawings in comparison had a hard time visually existing outside the context of Trial One. The sheer amount of different types of work on display may have been a strength and weakness. While it did reinforce Westvind’s idea of multiple realms existing at once in Trial One, it also felt too much to visually digest for one exhibition. It is hard to have these graphite drawings exist alongside the more developed work and not have them not appear simply as working sketches. Likewise, while both the screenprints and and paintings were compelling pieces on their own, I found it hard to view them together due to their differences in how Westvind handled each medium. 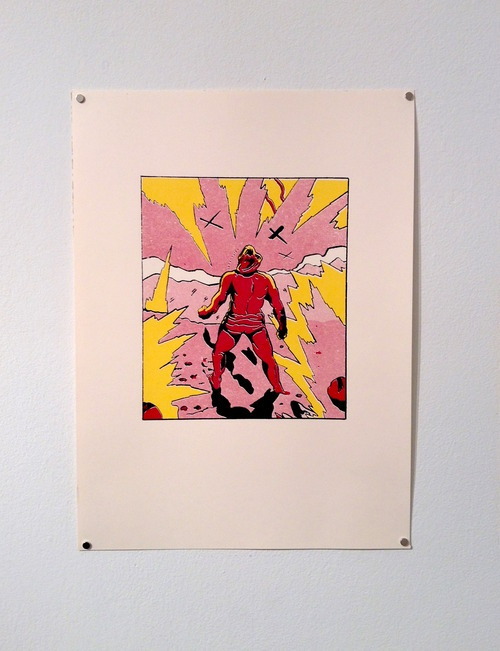 The screenprints utilized the flat, hard edged vernacular of both screenprinting and comic books, compared to the paintings which were realized in a more viscous manner accentuating the constantly melting and exploding flesh of the characters in Trial One. There is an inherent difficulty in creating a new exhibition based around an artist’s pre-existing work. Especially when that work occupies a completely different format such as a book. In this case, Trial One becomes a text with all the work on display nearly becoming secondary information. Conflict Unknown definitely had it’s beguiling moments, but at times felt as if it was too invested in sharing Westvind’s career as a whole instead of focusing on the singular exhibition context of Open Space.